meg + andy: the bow tie. Are you ready for some serious cuteness that will just blow your socks right off? Well, today is your lucky day. Here's our cutie pie sporting the bow tie. 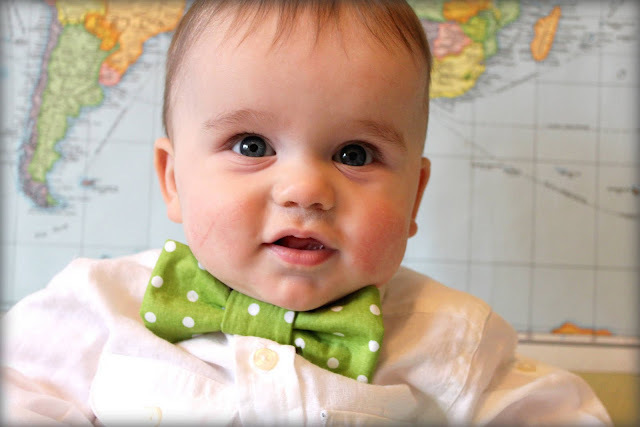 I looked at a bunch of bow tie tutorials but I think this one from prudent baby had the best explanations and pictures. I changed the dimensions on the neck strap and center piece just a little bit, but otherwise it was a simple project that you really must make for a little boy in your life a.s.a.p. I think I'm going to have to make one (or more) for my little man. So adorable. I've been wanting to make a couple for my little guys. Thanks for the tip on which tutorial to use! P.S. Your comments made me laugh :). Thanks for stopping by. hi! it's me, "handy andy"
thirty is the NEW three!